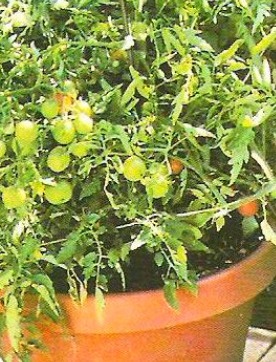 Growing tomatoes in pots is a common gardening method. Tomatoes are one of the best fruity vegetables to grow in pots. They are sometimes referred to as the ultimate container vegetable. When growing tomatoes in pots, you can choose to grow any variety that is suitable for outdoors. The patio types tend to be compact and can easily be confined in a smaller container. 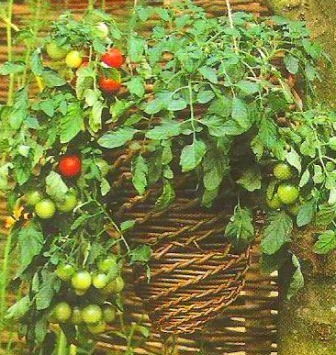 Tomato plants can look really attractive in hanging baskets. The best tomato varieties to use are the “Tumbler” or the “Tumbling Tom.” The “Tumbling Tom” produces some beautiful red or yellow fruity tomato types. These same tomato plants trail beautifully over the edges of a container. Hanging baskets can be found in some garden stores and online as well. Growing tomatoes in pots involve some special care. I must mention this because tomatoes do not respond well to fluctuating temperatures especially when the weather is a little cold. It’s very important to implement proper timing when it comes to your plants. If they’re planted out too soon, the foliage will most likely turn purple in color and this is definitely not pleasant to look at. Remember to properly harden off your plants to achieve the best results possible. It’s risky to put the containers out early unless you’re applying some temporary protection for them. You can wait until the beginning of summer or a little later to put out your containers. If you’re looking to get a well compact tomato plant that doesn’t require any pruning, “bush” varieties like the “Totem” for example is a good choice. Bush varieties also wouldn’t require any staking as well. They’re really easy to grow and maintain. The “Cordon” or the indeterminate types will require some level of support though. These “Cordon” varieties grow as single stems and must be trimmed and supported. There are a lot of beautiful varieties to choose from for growing tomatoes in pots. I like the cherry varieties like the “Cordon” and the “Sun Gold” for their delicious flavor and cute sizes. Another excellent variety is the “Novelty” variety for its pretty yellow fruits. The “Sun Gold” variety is a very tasty variety and is considered to be one of the best choices for pots and containers. Sow your seeds under glass in April and plant out as soon as June starts. You can set out 2 or 3 seedlings for each growing bag. Tomatoes need fully enriched soil to grow efficiently.Sow in pots in late winter and early spring to get some indoor crops. A container with a capacity of 3 cubic feet is required for standard tomatoes. However, dwarf and smaller varieties can be grown in pots or in big-sized hanging baskets with a capacity of 1 cubic foot. To provide some support, insert a stake or a tomato wire cage in the pot at the planting time. Then you can tie 1 to 3 main stems to the support as the plant develops. Growing tomatoes in pots can offer you so many options. This is due to the fact that they’re lots of varieties of tomatoes that are exceptional choices for pots. That’s why they’re my favorite fruity vegetable.